The Unlikely Homemaker: A giveaway, and why I can't "Spring Clean"
A giveaway, and why I can't "Spring Clean"
As much as I would love to join in on someones Spring Cleaning challenge, I cannot. Well...In order to wipe down my refrigerator, I'd be forced to empty it completely, of all the leftovers. Then, I have extra dishes to wash, and put away. On top of the dishes that I already didn't wash from yesterday and this morning. And probably some pans from before that. So, a simple task like wiping out the refrigerator turns into a huge project for me. And somewhere in between all that, I have a baby to nurse, and 3 preschoolers to watch. And laundry. Can't forget those cloth diapers that need attention! I've been following the blog A Slob Comes Clean, for a while now, and love all her great tips. After much internal debate (I am trying to curb my e-book addiction), I finally bought a book that might actually help me. At least I hope so! It's written by the author of the above mentioned blog. In 2 days (April 3rd) I will be starting a 28-day challenge, following the book 28 Days to Hope for Your Home and would love for you to join me! •Twenty-eight days of specific instructions to help you develop four basic (but essential) home management habits. •Insights into why these concepts seem foreign to you. •Practical tips to keep you from giving up. •Bonus sections with realistic strategies for laundry management, meal prep, and decluttering. •More than 45 pages of all new, exclusive content! 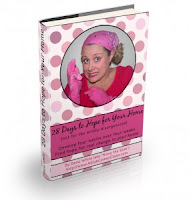 Before I write my first post about the 28-day challenge, I'll be announcing the winner of this PDF version of the 2 E-book set: 28-Days of Hope for Your Home and Drowning in Clutter? To enter, just leave me a comment in this post telling me your name and your most challenging homemaking task. If you want to by-pass the giveaway, you can buy the set here, and use the code SPRING13 to get both books for only $5.00, pdf version. *There are affiliate links in this post, but I have not been paid for promoting the book, nor have I been given any free product. I purchased this book myself to review and share...and hopefully to learn from! I've already started reading some of the tasks, and it sounds doable, even for me, with 4 little ones at home all day with me! I will announce the winner Wednesday morning. Please don't forget to check my first post of the day, and also Facebook. The winner will need to e-mail. My name is Amanda, and my most challenging homemaking task is keeping up with the laundry for our family of 6. My most challenging homemaking task is decluttering!! It's hard to keep things clean when there's too much stuff in the way.